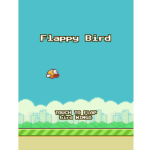 Flappybird was a nice game for Android and iPhone which is already removed from both stores. It is old style game which is very funny. Playing is amazingly easy, Just fly through pipes either through mouse click or just though taps in mobile devices.